An international team of scientists, including those from The Ohio State University and Vanderbilt University have just released their research into a newly discovered planet with some extremely unusual features. The planet was discovered in 2014 by astronomers at the Winer Observatory in Arizona. Using the KELT North telescope, they observed a small decrease in the brightness of the star known as KELT-9, in the Cygnus constellation. This dimming is a good indicator that a planet has passed in front of the star, so the astronomers kept up their observations. They noticed the drop-in brightness reoccurred every one and a half days, indicating that the planet in question completes a circuit around the star during this time. Further observations indicated that the planet, dubbed KELT-9b possessed some very interesting characteristics. The planet does not rotate, meaning that the side facing KELT-9 is constantly exposed to the immense heat from the star. 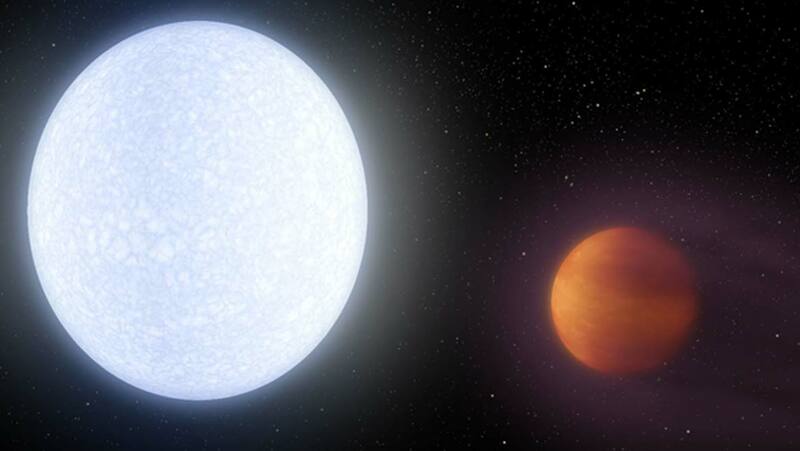 On the side of the planet facing KELT-9, the temperature is 4,600 Kelvin, or around 7,800 Fahrenheit. This makes the planet hotter than most stars. The planet is a gas giant, similar to Jupiter in our solar system. Whilst it is nearly three times the size of Jupiter, it is only half as dense. It is thought that this is because the extremely high levels of radiation has caused the atmosphere to inflate, similar to a balloon. These are important points for the scientists, as this high levels of exposure to radiation means that the planet may completely evaporate, giving them a unique opportunity to discover whether or not these planetary gas giants have a rocky core, as suggested by some theories. There are certainly signs to suggest that the planet is evaporating, as there appears to be a tail of gas leaving KELT-(, similar to those we see in comets. The paper, titled ‘A giant planet undergoing extreme-ultraviolet irradiation by its hot massive-star host’ has been published this week in the journal Nature. Whilst many astronomical observations are focused on identifying planets similar to our own, there is also a great deal of value to be found from observing other phenomena.